One of the main reasons for my world travel is to reconnect with humanity and see cultures in different parts of our planet earth. I achieve maximum satisfaction when I glimpse the way of life of many communities around the world, their challenges, whether it’s their survival mechanism or running their day-to-day responsibilities like raising family and children or fulfilling their dreams and hobbies. I always compare my situation in the USA, my newly adopted land which I have lived in the last 23 years. 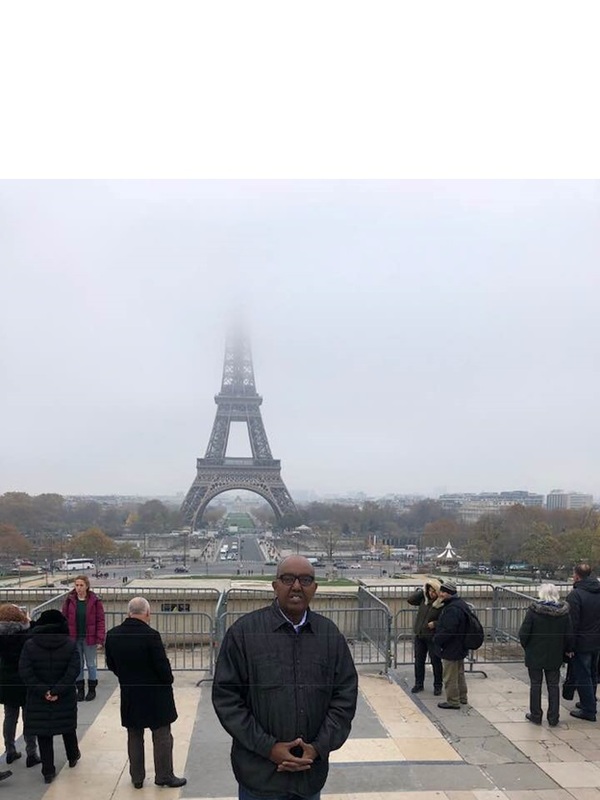 I haven’t been back to Somalia since the start of the civil war – I just hope one day that I will take one of my travels to a peaceful Somalia. When I come back from a trip, I feel young and rejuvenated; I go back to my work and family with renewed energy, looking for information on my next trip. Few days after my return from my recent Europe trip, I decided to make my next adventure to South-east Asia, parts of Indochina (Vietnam, Cambodia & Thailand) on early next year. Most importantly, my travels to Europe provide me knowledge, history of ethnic and religious wars, monarchies and conquest of territories. I come across centuries old architecture and human development. What would you think the importance of visiting France, a country that plays an important role in the world affairs now and in the past? What effects do they have on the globe, particularly the countries they colonized – imagine walking through centuries old palaces, cathedrals and monuments; think of what’s like participating walking tours and acquainting yourself with the history of men like Napoleon Bonaparte and Louis XIV; what about the French Revolution. Coming to the Iberian Peninsula (Portugal & Spain), It was like a magnet – I’m attracted to old history of these nations whose existence dates back 800 BC. These lands were inhibited and ruled in different periods by Celtics tribes, Romans and Germanic Kingdoms, but one thing that fascinated me most is the Islamic heritage and rule of the Islamic Caliphate for 700 years – during that time, the Peninsula became center of learning and culture. This time I wasn’t fortunate to visit the Southern part of Spain, the Andalusia where Muslim heritage is visible. Cities like Granada, Cordova, Malaga & Seville were the center of 700 years Muslim rule; Gibraltar is also an important place to hop in for quick look – it was where the Islamic army headed by Tariq ibn Ziyad landed on 7th Century. I will come back to this area for further exploration and should plan to stay at least a week. Isn’t befitting to go and tour Portugal, one of oldest nations on earth. Portugal is located in the far west of Europe, on the Iberian Peninsula. It is bordered by Spain to the north and east, and the Atlantic Ocean to the south and west. I visited a place called Caba da Roco, located in the most western edge of Europe on a rock at the Atlantic Ocean – in my observation; I thought I was at end of the earth. Portugal is a country emerged after the Christian re-conquest of the Iberian Peninsula from the Muslims and was ruled by King “Alfonso I”. I relate Portugal to my childhood era, my time in the Middle School in Somalia – we were taught Portugal’s Fifteenth and Sixteenth Century overseas exploration and conquest in Africa; Vasco de Gama, a explorer was the first to discover India by sea route and Bartolomeu Dias was the first European to discover the Cape of Good Hope, the most southern tip of Africa. By visiting Portugal, you will see the traces of all that history. When most of the people prefer to travel during summer season, I favor to travel during off season for obvious reasons; I’m a budget traveler and I spend half of what it would have costed me in peak seasons; tickets, hotels are cheap; you will not see more tourists and busy streets; you will afford to go cities’ attractions and restaurants. It’s not easy to plan a travel between multiple countries, buying a ticket and choosing a travel with plane, train, ferry & bus – the most important thing is to choose a place to stay that’s near the center and the airport. This trip I stayed in Hostel. Apart from the low price, you will share a room with minimum six persons and it’s a great way to connect with fellow travelers – in my case, as a man in his fifties, I was able to stay in room with young European men and women. The hostels arrange walking tours to the city; they organize activities such as cooking and sharing traditional food; they take you to the city at night and offer a taste of the night life. My family and friends thought that I was crazy on my choice to stay in Hostels; they thought that these places are for the youth, not for an older guys like me; that it’s not safe and my belongings could be stolen, but it turned out to be my best experience in my whole trips. Paris has been called “the city of love,” owing to the beautiful architecture and skyline, its history as a center for new art, fashion, literature and ideas; It is also called the city of lights (La Ville Lumière) because of it was a central city for new ideas and progressive thought during the period of Enlightenment, but also because it was one of the first cities to install lighting in the street. The Eiffel Tower was built for the Paris World Exhibition of 1889 by Gustave Eiffel. 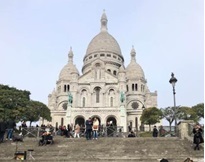 Climb to the top, and you won’t be disappointed by the view of Paris. It’s one of most recognizable landmark in the World. Arc de Triomphe and Champs-Elysées, Another symbol of the French power, the Arc de Triomphe was ordered by Napoleon Bonaparte to commemorate the victory of the Battle of Austerlitz in 1806. Today it commemorates the First World War and holds the flame of the Unknown Soldier. The Arc de Triomphe also overlooks Paris, the Avenue des Champs-Elysées in particular, known to be the most beautiful avenue in the whole world. Lisbon is one of oldest city in the world and one of the oldest in Western Europe, predating other modern European capitals such as London, Paris, and Rome by centuries. Torre de Belem, Located on the bank of Portugal’s Tagus River, Belem Tower was built under King John II’s orders as both a defensive structure and ceremonial gateway to Lisbon. Rooftops of Alfama: These vibrant red tiled rooftops can be found in Alfama, the oldest district in Lisbon. During the days of Muslim conquest, in the 6th century, the district constituted the whole of Lisbon. Vasco da Gama Tower: At nearly 500 feet, the futuristic-style Vasco da Gama Tower is Lisbon’s tallest building. Madrid: The city has almost 3.2 inhabitants and a metropolitan area population of approximately 6.5 million. It is the third-largest city in the European Union (EU), smaller than only London and Berlin. Royal Palace of Madrid is the Spanish royal family’s official residence, but it is now used only for state ceremonies and receptions. Gran Via, the stylish street of Gran Via is home to the best upscale shopping in all of Madrid. By night, the street transforms into the hottest place to experience the city’s wild nightlife. Sagrada Familia The Basílica i Temple Expiatori de la Sagrada Família is a large unfinished Roman Catholic church in Barcelona, designed by Catalan architect Antoni Gaudí. The Barri Gòtic, or Gothic Quarter, is the oldest part of Barcelona, and considering its location next to the city center, also it’s most livelily. The Bunker was originally built in defense of Barcelona during the Spanish Civil War and has since been abandoned. Due to its defensive location, the bunker looks over the entirety of the city centre and onto the ocean! The ruins of the old structure now serve as a viewing point for visitors to hangout and enjoy the view.